DON'T LET RUNNING YOUR MUSIC BUSINESS HINDER YOUR CREATIVITY. Every year millions of dollars in royalties are left on the table because music creators and rightsholders do not register their songs and recordings with the organizations that administer licenses and distribute royalties. We want to change that. TuneRegistry simplifies your catalog administrative operations by putting all of your music registration needs in one place. We make it easy for independent artists, writers, labels, and publishers to set up, manage, and deliver Song, Recording, and Release information to the rights, metadata, and business exchanges that power billions of music-related transactions every year. TuneRegistry does not act as your publisher nor label, so you retain 100% of your rights and 100% of your royalties. 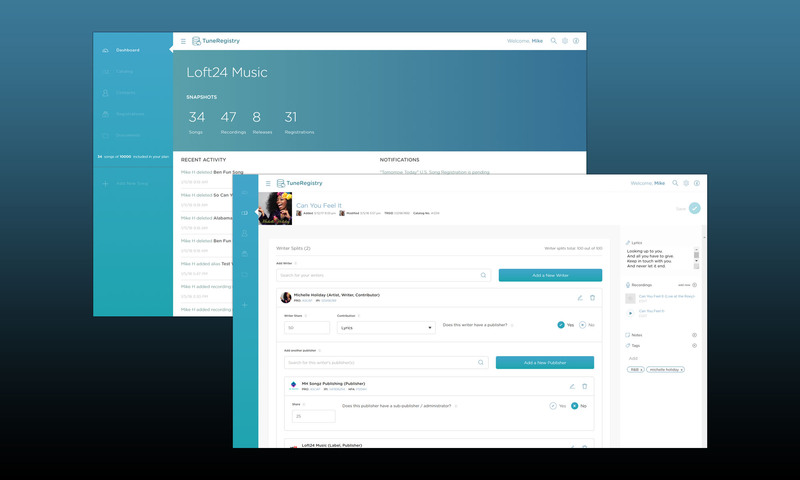 Our technology intelligently and seamlessly integrates with the top rights and metadata exchanges in the U.S. to send and receive registrations and information on your behalf (see the TuneRegistry Network). Where applicable, these exchanges send royalty payments directly to you or your designated payee. We're striving to make TuneRegistry great, so don't be afraid to chime in. If you're an existing customer and need help with the platform, check out our Help Center. You can also contact support by logging in to your account and using the in-app messenger to chat with one of our support representatives or by emailing us. Just browsing and want to ask us a question? Check out our frequently asked questions page or scroll over to the little chat icon located in the bottom-right corner of your screen to initiate a conversation with us. If we're not on right now, we'll get back to you via email later. Want to speak with a sales representative? Call us toll-free during our normal business hours (Monday - Friday, 9am - 5pm PST) at 1-800-647-8238. NOTE: Customer support will not be provided over the phone unless the caller is subscribed to an account plan that includes over the phone support. Please review your account plan prior to contacting us for phone support to determine if your account plan includes phone support.